al-Adwiyah al-mufradah al-musta‘malah bi-khawaṣṣhā wa-af‘ālhā al-mashhūrah bi-hā bi-hā (Useful Simple Remedies with Their Properties and Utilities for Which They Are Renowned). 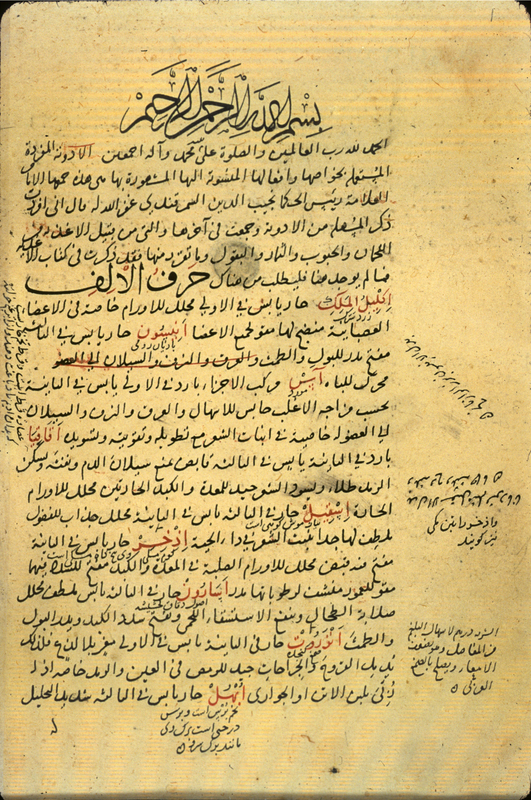 was another of the essays making up the compilation referred to under the title: al-Najibiyat al-Samarqandiyah. For other copies, see Ullmann, Medizin, p. 278 note 5; and A.Z. Iskandar, 'A study of al-Samarqandi's medical writings', Le Museon, vol. 85 (1972), p. 458 note 53. For six copies in Turkey, see Ekmeleddin Ihsanoglu, editor, Fihris al-makhtutat al-tibb al-Islami bi-l-lughat al-‘arabiyah wa-al-turkiyah wa-al-farisiyah fi maktabat turkiya; Catalogue of Islamic Medical Manuscripts (in Arabic, Turkish, and Persian) in the Libraries of Turkey, prepared by Ramazan Sesen, Cemil Akpinar, and Cevad Izgi (Istanbul: Research Centre of Islamic History, Art and Culture, 1984), pp. 378-9. The opening page of al-Adwiyah al-mufradah al-musta‘malah bi-khawaṣṣhā wa-af‘ālhā al-mashhūrah bi-hā bi-hā (Useful Simple Remedies with Their Properties and Utilities for Which They are Renowned) by Najīb al-Dīn al-Samarqandī (d. 1222/619). 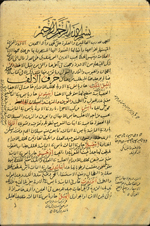 The copy was made during the last ten days of Ramadan 740 (= March 1340) by the copyist Muḥammad ibn ‘Abd Allāh, known as al-Shams al-Tasatturī the physician (al-mutaṭabbib). There are Persian marginal and interlinear annotations. Arabic. 27 pages (pp. 1-27). Dimensions 23.4 x 15.7 (text area 16.5 x 10.5) cm; 23 lines per page. The title al-Adwiyah al-mufradah al-musta‘malah bi-khawaṣṣhā wa-af‘ālhā al-mashhūrah bi-hā bi-hā taken from first line of text (p. 1). In the colophon (p. 27) the title is given as: al-adwiyah al-mufradah ('the simple remedies'). The author's name is given on p. 1. The copy is dated in the colophon (p. 27, lines 5-8) al-‘ashr al-akhir min Ramadan 740 (= March 1340), where it is stated that the copyist was named Muḥammad ibn ‘Abd Allāh, called (al-mulaqqab bi-) al-Shams al-Tasatturī the physician (al-mutaṭabbib). In colophon (p. 27) the treatise is described as the final section of al-Najibiyat, a term used to refer to a collection of Najīb al-Dīn al-Samarqandī's writings, also called al-Najibiyat al-Samarqandiyah. The text is written in a small naskh script, in black ink. There are headings in red and also in a large black script. The letters ‘ayn and the gutteral ha' often have minuscule letters beneath them, especially in rubricated words. The letter sin often has three dots beneath. There are catchwords. There are marginal corrections in Arabic, and also Persian interlinear notes and marginalia. The thick, lightly-glossed, biscuit paper has indistinct wavy laid lines and no chain lines. The paper is fibrous with uneven patches. There is some soiling through thumbing and some dampstaining. The volume consists of 37 pages. Pages 28-30 and 34 are blank. Item 1 (pp. 1-27) is the item here catalogued, item 2 (p. 31-33) is Fī Ittikhādh mā’ al-jubn wa-manāfi‘uhu wa-kayfiyat isti‘mālihi (apparently also by Najīb al-Dīn al-Samarqandī and below) (MS A 1.1, item 2), and item 3 (p.35-37) consists of recipes for remedies (MS A 1.1, item 3). The volume is bound in a modern library binding of blue cloth over pasteboards with a black leather spine; modern paper pastedowns and endpapers. There are impressions of a small round owner's stamp on both p. 1 and p. 27 that has the name ‘Abd Amīn Muḥammad and is dated 1165/1751-2. The same stamp is to be found in NLM MS A 28. Purchased from A. S. Yahuda (ELS No. 1664, Med. 33); received by the Armed Forces Medical Library in September 1954, from the office of Dr. Claudius Mayer.